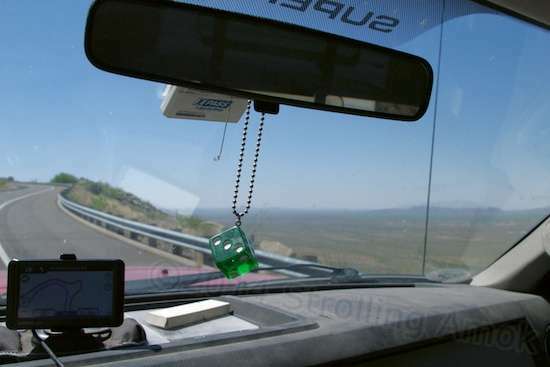 Well, besides highlighting my dusty dashboard, rearview mirror with unlucky die, GPS and expired I-Pass tollway gizmo, the other emphasis here is the rapid climb from Congress toward Prescott, AZ. 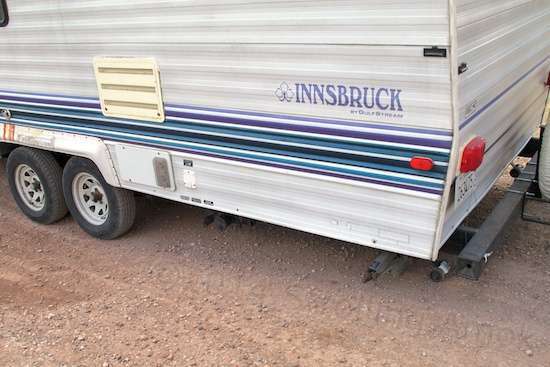 Soaking in heat is not my idea of fun times, so as Wickenburg heads toward a high of 89 today, the tiny townette of Paulden, AZ is expected to reach just 79 degrees. It’s the higher altitude. 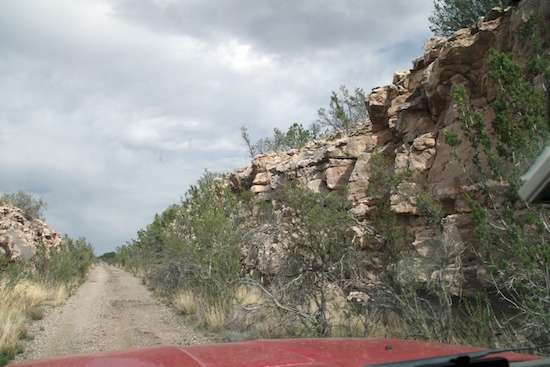 I’m just north of Paulden, parked beside a section of “Old US 89”, a bypassed portion of what is now State Route 89 that runs from Congress to Ash Fork. “What to what?” you ask? From what I can tell, US 89 used to run from Mexico to Canada. Since then, it’s been chopped, abandoned, and incorporated into other highways. Information on my little piece of it is especially hard to come by. But let me start at the beginning of the day’s journey. As long as the pavement is reasonably smooth (and what isn’t after driving in Illinois?) I find piloting the Defiant toward the next destination to be a pure pleasure. Looka that terrain! The total distance is around 100 miles and takes about 2.5 hours, in theory. 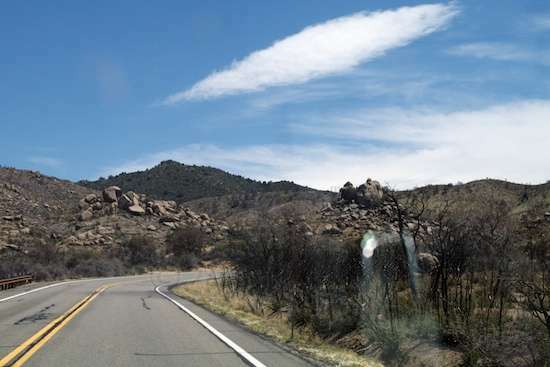 The most direct way to head from Wickenburg to Paulden is to take the short stint on 93 from Wickenburg north to Congress, then just stay on 89 to and through Prescott and points north. Naturally, with the Defiant in tow, I can’t do that – just south of Prescott, 89 turns into a twistfest that takes rigs over 40 feet into nightmare territory. Such vehicles are prohibited, and articulation doesn’t matter. Fitted for intergalactic travel, the Defiant measures 53 feet from snout to tail. That’s the length of a standard semi-trailer box. 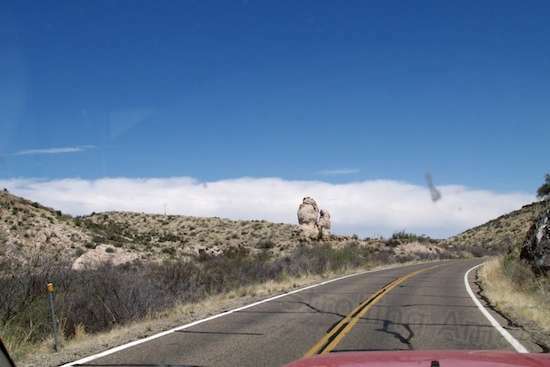 Good thing the roadways are pretty empty – with odd rock formations like this, I sometimes drift a bit in my lane. Once north of Congress, 89 is a slow, split 4-lane that weaves and climbs relentlessly. It is gorgeous, though I’d hate to try it in an older vehicle with less than perfect engine cooling. The Ford’s cooling system is colossal, and as of today, I’ve only heard the thermostatically-controlled radiator fan turn on three times in a year and a half. This climb represented two of them. But this ride is mighty scenic, a fact which almost overrides one’s noticing that there’s no place to pull over should mechanical problems arise. Just short of Prescott though, this road is officially rated as “extremely scenic”. I wouldn’t care to see that section with the trailer attached. I suppose that if you grew up here, sights like this would be no big deal? Not for me – I gawk! 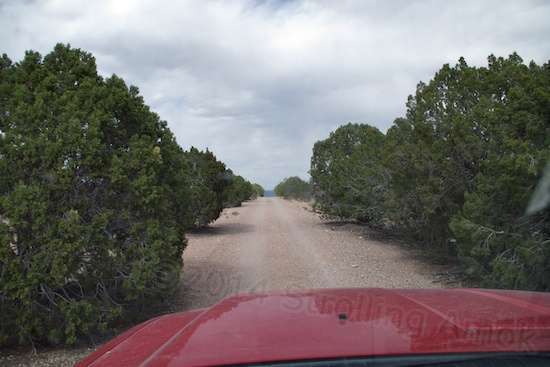 The way around this is to head up toward the offending area, but then dodge westward through Kirkland and the alluring Skull Valley using Kirkland Road and Iron Springs Road. 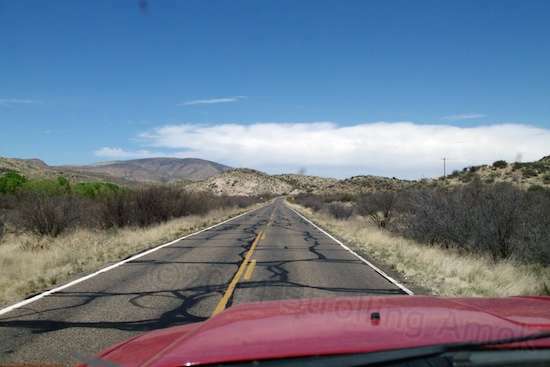 The latter finally bends eastward toward Prescott and the safe continuation of 89, but this year I diverted further north on Williamson Valley Road to avoid the squeeze of traffic. Prescott is a sprawling, fabulous town, but not in something that maneuvers like the Queen Mary. 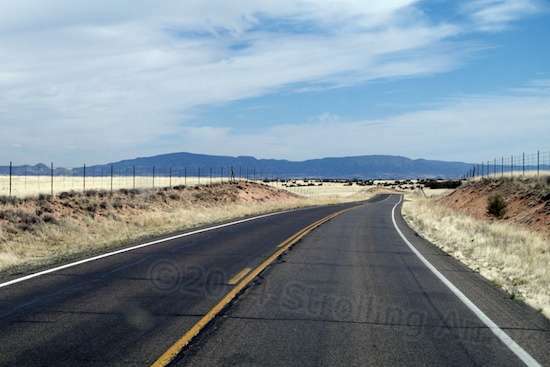 Williamson is west of Chino Valley, and County Road 10 makes a very nice way to rejoin 89 in Chino Valley. Paulson is just ten miles further north. In this area, 89 is a wide, smooth ribbon of asphalt that makes driving effortless. The surprise of the trip for me was the drive through Williamson. Looking at its location on a map, I figured it would be like all the other remnant towns along the way, but with even less reason for being there. In fact, I was concerned that the road quality might be poor enough to pose some kind of challenge. Not so. Williamson, Arizona has homes so large and tastefully upscale that it boggles the mind, yet lot sizes are not that big. 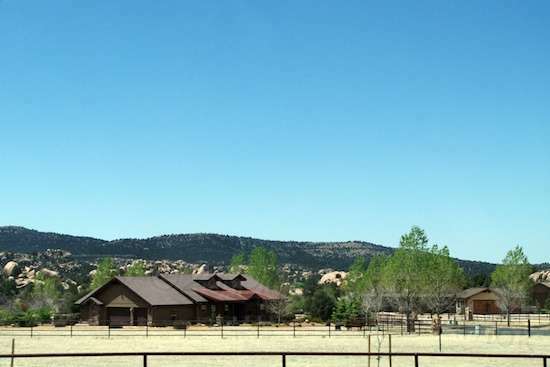 I was astounded to find that it resembled some kind of upscale vestigial suburb of Prescott, which in itself multiplies real estate values beyond the ability of humor to make it to an absurdity – it’s already there. There was one development of clustered homes in Williamson, each substantially larger than any three country club clubhouses you’ve ever seen. While it’s true that I’m now coming from a grand total of 200 square feet, I still can’t imagine first, what you’re supposed to do with what looks like 45-50,000 square feet of home and second, what it takes to keep it clean and operable. Yet, they are packed on just a few acres each. All that cost, and you can’t go fetch something out of your car without being in full view of your neighbors. Is that one of the goals? This might be chino grass, for which Chino Valley was named. It was harvested for horse feed. If that’s what this is, it doesn’t look real nutritious. Makes me realize just how blessed I am. 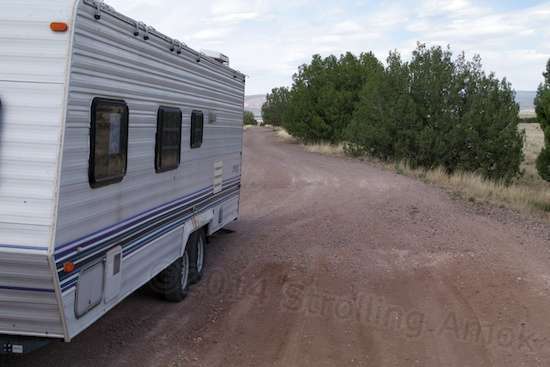 Now that my boondocking season has started, I can see (and sometimes hear) traffic on SR-89 a mile away. 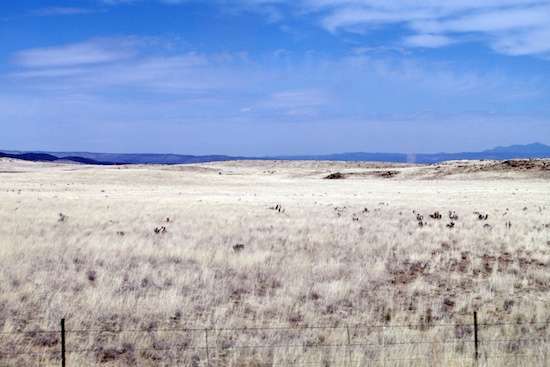 Other than that, there’s only grassy prairie and low mountains in sight. I get maybe a couple of vehicles a day going by. I could skulk out to the truck in PJs and bunny slippers to retrieve a CD, for all the difference it makes. Almost looks like frost or light snow, doesn’t it? My goal this year was to camp here on BLM land again, but in an area that I’ve never found to be recommended, and never observed a camper on. 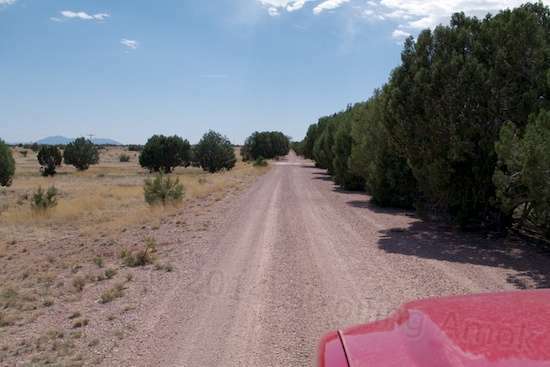 That would be a 4-mile section of Old 89 that starts just north of an intersection with SR-89 proper, and runs straight as an arrow NNE toward the once-upon-a-time town of Drake, A.K.A. Cedar Glade. Lime and sandstone were mined here, which brought in the railroad in 1901. The town’s name was changed in 1920 to the last name of the manager who was in charge of the area’s railroad construction in 1899. 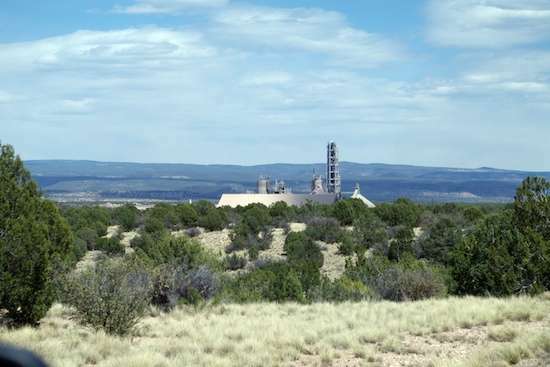 A sprawling new cement plant now occupies the site, and while the railroad station was moved to Chino Valley to serve as a restaurant, the picked-over ruins of the original hotel, general store, restaurant and other buildings are essentially built over. It was renamed in 1920 to Drake, and yet the town has long since disappeared! It’s not the only one to do that in this area. 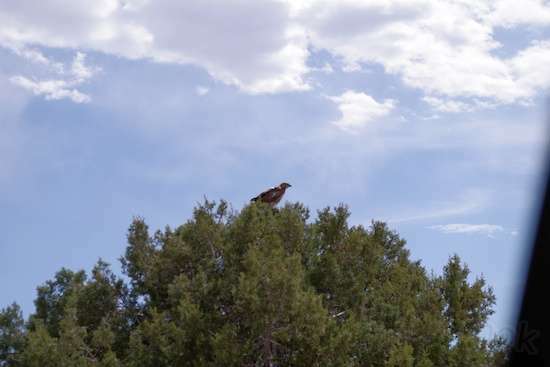 As I pulled close to the south entrance of Old 89, I could see that trying to get the Defiant up there onto the pavement might prove disappointing at best. 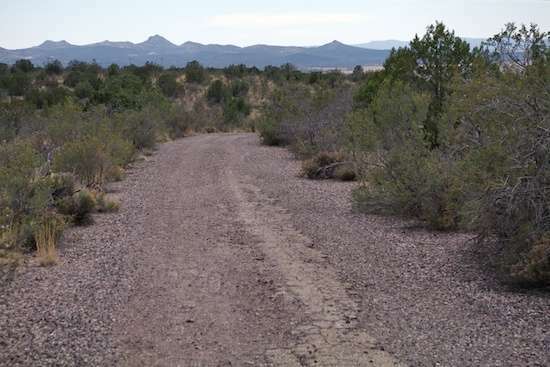 Nearly the entire 4-mile run up to Drake along the abandoned section of the original 89 is now on BLM land, and is designated by them for use as a camping trail. 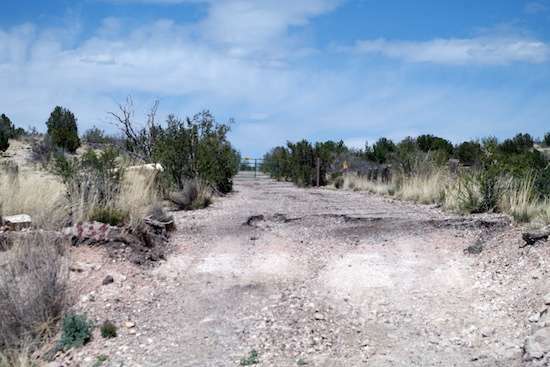 There are several dirt trails coming off of it, but none are approved for camping or even motorized vehicle travel anymore. You must camp within 300 feet of an approved trail here. So it’s available, and yet unused. Why? 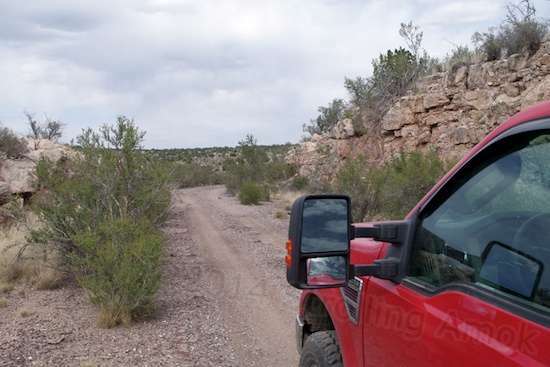 Same reason as many other designated trails on Motorized Vehicle Use Maps: a trail that’s approved for RV camping may or may not actually be accessible by an RV, save for pop-up truck campers which can go nearly anywhere. 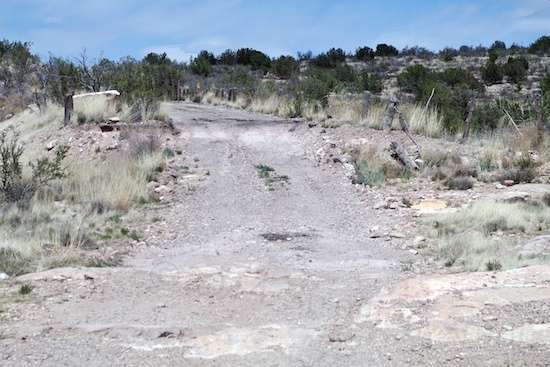 Some are strictly high-clearance 4WD trails, while others are okay for a ways before they start to pose some challenges. Old 89 is in the latter category. Had I been able to make it, the BLM gate is just ahead. It proved just as well, the south-most mile of the road has a couple of issues for low-clearance vehicles. 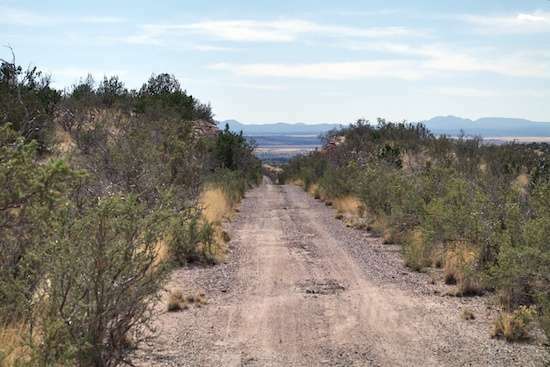 What I was hoping for was to camp toward the southern end of Old 89 in order to minimize the distance to Paulden and Chino Valley for supplies. Even if access with the trailer could only be gotten from the far north end, the truck should be able to do its errands from the south entrance, eh? So, coming up from the south, I dived off 89 at the first sign I saw that pointed toward “Old 89”. That was a mistake, but only from a convenience standpoint. It was a narrow two-lane in fair shape, with houses and ranchettes all along it before it bent back to rejoin 89. I dived off again at the next opportunity, and went along a battlefield that had once been a decent two-lane asphalt highway. Now, missing strips of pavement ran across it. 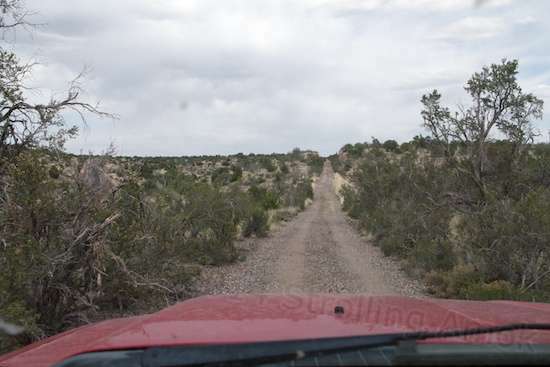 It required a slow idle to navigate, and people on the few tired-looking ranches along it had simply ignored it and run along the shoulders – something I couldn’t do because of their marked tilt. About a quarter-mile of this made me impatient for the gravel ahead, but what was beyond that was hard to see. It looked kind of like a pile of gravel and rocks mounded across the road, blocking it. “Never drive in further than you are willing to back out” was put to the test today. Fortunately for me, I lucked out later, and just happened to choose the last and only place on Old 89 to stop and back around. Actually, that turned out to be a rough climb to a resumption of the original highway, some five or so feet up. It was hard to tell what had happened just short of there – it was as if the raised roadbed incline had been completely removed several feet down. Given that there are a couple of ranch entrances near there, that’s actually a possibility. I got out to evaluate what was ahead. 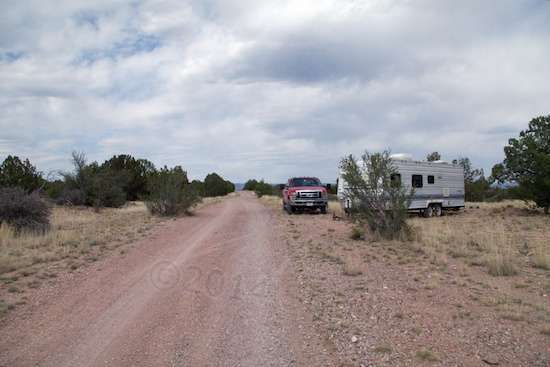 The good news was that the gated entrance to BLM land was just ahead, right on top of a single lane of usable pavement. A chain was used to hold it closed against stray cattle, but it was not locked. 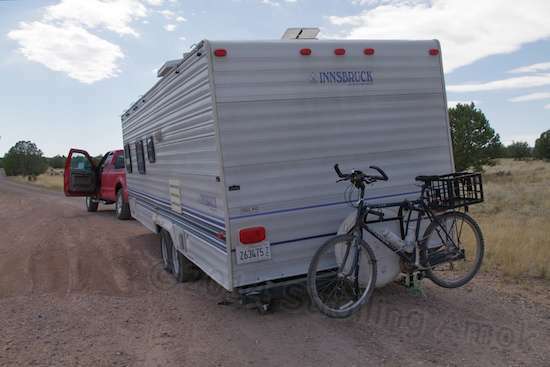 The bad news was that the trailer had no hope of making the climb up to the pavement. Erosion around some huge submerged boulders guaranteed a solid ground-out at the tail. I’d have to back down a couple hundred feet and get back on 89 to try the northern approach. Detouring around to access Old 89 via the north end revealed Drake Cement’s new plant. Hard to believe, but it’s Peruvian-owned. What’s up with that? Even so, I was already fascinated. This entrance point was along a built-up ridge of considerable height, which was now just over one lane wide. The roadway sides dropped into a deep valley that had to be bridged, before cutting right through a solid rock hilltop a little further on. What a project! For an early, abandoned roadway, this thing had absorbed considerable money and manpower to create. Between that and heading for a now-dead town, maybe that’s why it was abandoned. Much of it is built on raised earth to keep it from getting inundated in wet weather, and there are numerous concrete culverts to allow water to flow from one side to the other. All in, I can see why a clean-sheet approach would be preferable if rights could be obtained for a different path. Most of the old highway looks like this. Each low point has a two-lane concrete bridge that allows water to flow under. The other fascination for me is, oddly, road width. A few sections of this thing look like it couldn’t have been two lanes throughout, the southern entrance especially. The erosion of the raised roadbed over time seems just too extreme in places, given the time available since it was built. And when was it built? I can see having a single lane here and there in areas where it was impractical to build two, but this can’t go on for any distance. You can’t insist that someone back up an eighth of a mile in a pinched-down area, no matter what era you’re talking about. The width between the sheer rock walls looming overhead also seems too narrow. What’s going on here? Just a low spot. But then I remembered Route 66. Many pieces of it were never torn up, and yet aren’t there any more. The only way to tell where it went is the telephone poles alongside. And 66 is absurdly narrow by today’s standards. When present, guardrails are right at the outer lane marker line, and the lanes themselves are often a squeeze even in problematic curves. Finding a place to pull over to change a flat is often a luxury, since shoulders are often absent. This little piece of abandoned 89 is quite similar in that, and in the way the road simply follows the ups and downs of terrain instead of cutting through it. It’s Old School civil engineering, when men were men, budgets were small, per-mile costs were high, driving assumed a moderate level of competence and accountability, and recalled stories about driving somewhere often filled out conversations. There were tales to tell, and the roadways helped create them. I drove around this low spot as far as I could, but got out to see how my rear skids were doing. I don’t know exactly why defunct roadways take on such an appeal to me. It’s absurd. Anything that took on early motorcar travel and still looks like it did seems to turn me into some kind of cross between Yoda and disruptions in The Force, and the Horse Whisperer – for highways instead of horses. And, such roads need to be abandoned so that their place in time is finite. I suppose it’s similar to the feeling one might have when seeing the remnants of a Conestoga wagon trail going across a prairie (which can be be done even today). I suppose it has to do with my awareness of just how deeply the hobby machine once called the horseless carriage has altered and shaped society in this country, and the many impacts it has had, good, bad, and otherwise. Answer: one skid was on the ground and the stabilizer it protects (just forward of it) was barely clear. When I whine about 10-1/2″ of clearance on a 9-foot overhang, this is what I’m thinking of. Vintage TTs are like this. Fact of life. Perhaps you could relate it to visiting the remnant of a long-abandoned cabin in a remote area. Roughly made but serviceable, devoid of power or gas for heat and light. Just a wood stove and a blackened kerosene lamp hung from a rafter. The sight is a reminder to us that life was very different at one time, and because of that, so were the values and expectations of people who were in many ways not a bit different at core level than we are today. Pretty, in its own way. This could be two lanes if not for the “new” bush encroachment. We have an innate tendency to think that our superior technology is the proof that we have progressed and evolved into superior beings, compared to times past. We now exist on a higher spiritual and moral plane, we think, never to “revert” to more backward ways. And yet, whenever advanced civilizations of the past were obliterated by warfare and their populations either wiped out or “re-educated”, the conquering heroes often purged their knowledge and technologies along with them, leaving us to wonder today how such obsolete, dead-end societies managed to accomplish this or that remarkable feat. A large hawk flew over the truck and alighted on this tree beside the road. My contention is that we as people haven’t changed a whit in thousands of years. We are driven and shaped by the life circumstances around us. We are inherently adaptive, and thus people of our time and place. But despite the huge differences in how we live, we ourselves haven’t changed. Drop today’s American newborn into Persia of 3,000BC, and he will (if he survives physically) become the everyday citizen of his time and place. Grab that ancient Persian newborn and raise him in today’s Chicago suburbs, and he’ll be amassing electronic gadgets, texting friends, and confounding his concerned adoptive parents with the best of them. His values, priorities and outlooks will be indistinguishable from our own. His unique gene pool will affect the personal challenges he may face, but so do we all. Our technologies do not change us at core – they change the circumstances that we face, change the nature of our decisions, and alter our ways of living. 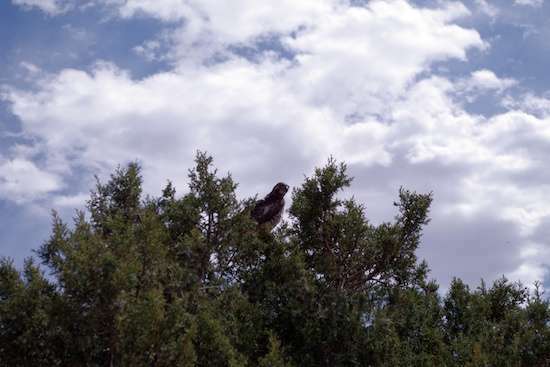 As I approached and passed by, it stayed put and watched from just 15 or 20 feet away. What does this have to do with abandoned paving materials? 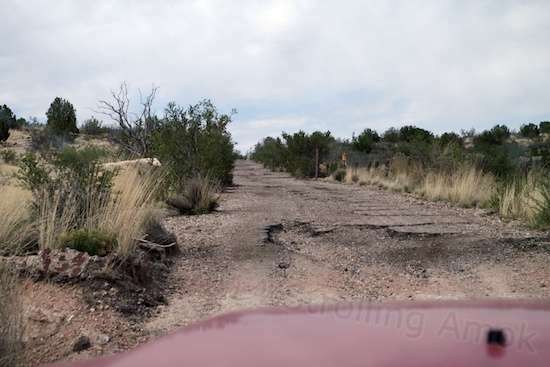 When I see the long stretches of abandoned Route 66 or this one little piece of 89, I can feel history. Today, like so many other technologies, we take car travel for granted, with about the same level of involvement as using a cellphone to check in at home. At one time and for a considerable time, travel by motorcar was by its very nature exhilarating, adventurous, and a calculated risk. It was a force of change. Like photographic cameras of the time, automobiles required a commitment to knowledge and practiced skill. Like rail travel, they actually changed lives and ways of life. And such crumbling little pieces of asphalt are to me a record or reminder of the “normal” course of lives and personal histories being affected by the impact of this new technology. Some good, some bad. And then this one little piece of affective force stopped. 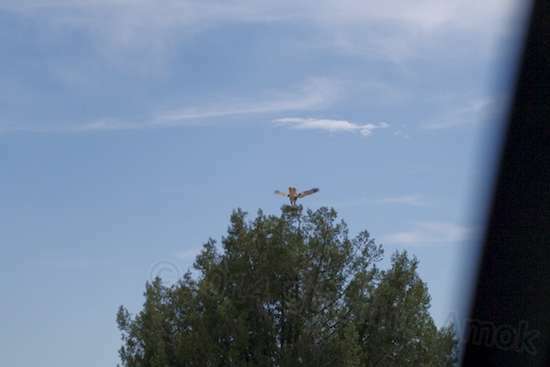 …And then it flew ahead to the next tree and watched me pass that one. Must have been pretty bored today! Don’t worry about me though. You won’t find me solemnly touching the gravel or putting my ear down to the broken pavement to hear the echoes of the past. But now and then you may find me stepping over to gaze down the road’s length near sunset or at dawn, or hike/bike down it a ways for my exercise. I’ll just be adding my momentary presence to the multitude who have passed along that way and gone on, only my reason for doing so will be for no particular purpose – just to commune with the tarmac. “Get Your Kicks on Route 89” just doesn’t sound the same as the original song title, does it? “Life is fine on Route 89”? “Head for the mine on Route 89”? Oh, forget it. I dropped the trailer and continued on to see if there were any spots closer to the south entry. Notice the vestiges of pavement along the center. I’m not noticing any extra width in this road! Paulden is dead ahead. Looking into the south entrance, with the gate now open. Why’s the pavement relatively intact down here, and gone further north? The south entrance requires high clearance, but not 4WD. Heading back to the camper shows how the road was hewn out from the hilltop. It allows two lanes, and that’s it! 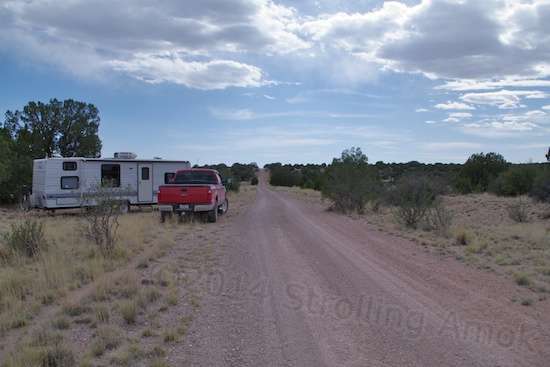 The trailer is probably a good mile and a half from the south entrance. Wow, if this is two lanes wide, it’s a paint scrapin’ two lanes! How much manpower would something like this take? And then a comfortable width, if you delete the trees. Home sweet home. It’s difficult to be concerned about privacy when there’s no one in sight all day. A shot in the other direction. Not scenic, but not half bad. And I can’t argue with 3-4 bars of cellular data signal without even turning on the signal booster! I had concerns about the truck’s hot exhaust setting the ultra-dry tall grass on fire, but this site was the only bare spot for miles, and level, too! 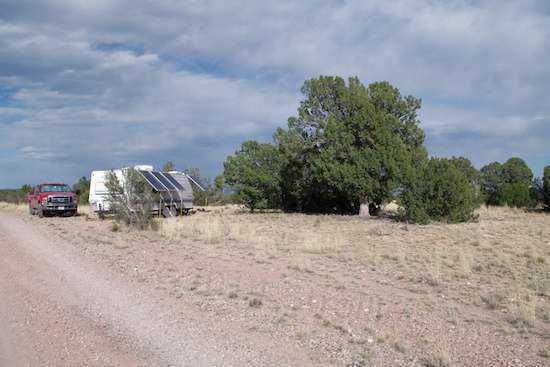 Those trees wound up not shading the solar panels due to the trailer’s orientation and the sun’s high arc. Thank for the tour of the old neighborhood. Looks doable. Enjoyed the read. Thanks, Swank! Unfortunately for you guys, I may not be completely done yet, but there are several areas on the way down the length that are flat and can be pulled off on, of as well as trails that are now officially persona non grata for motorized travel. So, they can and should be clogged for awhile as far as any enforcement is concerned. But I was spooked about the dry grass, which ranges from 12″-18″ high and is thickly dispersed throughout. Good way to wear out one’s welcome, starting a brushfire. Who would’ve thought a long-handled scythe would have come in handy? Because of tree encroachment, several flat road edges have become decent, protected pull-offs, if worst came to worst. But any rig the Defiant’s size or larger should really explore solo first, to judge turnarounds and shoulder ground clearances. Despite a few dips, the road is smooth overall. Good point, Linda, and a very nice article. What has me stumped here at first blush is that some of the pinched areas look to be blind, which would be a no-no. I’m hoping to do my version of Sherlock and check it all out though. Brother, wouldn’t I be the fascinating conversationalist at a happy hour! Zzzzz! Thank you, Chris! I’m starting to suspect that dressing up weird obsessions and stark ignorance to resemble thoughtful reflections may be a workable writing style for me. Considering my stockpile, hey, I can do this! I love the pictures and I would have not braved that road glad you did my homework for me. Well, if you mean Old 89 Linda, the northern approach near Drake using FR-680 is a cakewalk compared to trundling along FR-573 across the highway. 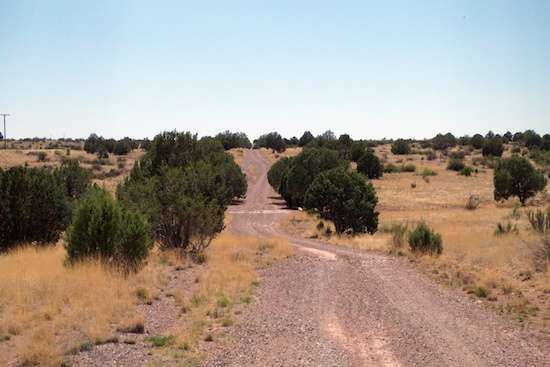 Old 89, now labeled FR-9711F, is actually a moderate-speed gravel road punctuated by some deep sinkholes that require evasive action and slowing way down. If the Defiant can make it, anything can. 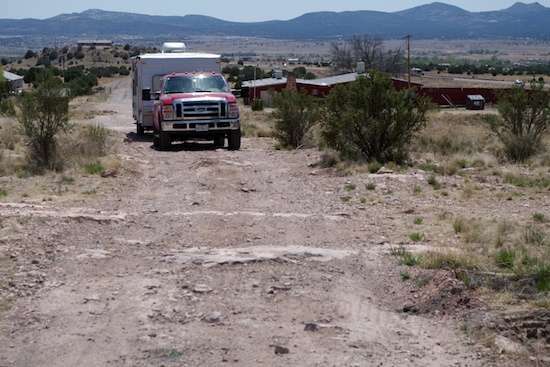 I guess the real sticking point is that, like FR-573, it’s effectively a dead end road for most RVs, and finding a workable turnaround area for a particular kind of rig can be an issue along Old 89. If your rig can’t back up or do a three-point turn in a poor-clearance situation, this whole area should be considered off limits. Old 89 is a paradox in that it’s in fab shape for an NFS trail come rain or shine, but offers few established campsites along its 5-mile length now that side trails are considered off-limits after 300 feet. The south entrance isn’t suitable for passenger cars, but even a respectable 2WD minivan can make the climb, with care. I like where you take your readers as you travel. Great post. Insightful and entertaining. Difficult to attain and you do it so well.